Pioneers in the industry, we offer polycarbonate embossed sheets, pc embossed frosted matt sheet and ps ice crush sheet from India. 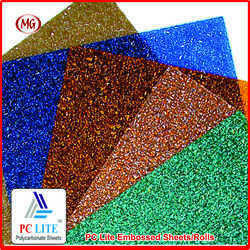 PC Lite Embossed Sheet has several features with high impact resistance, light weight, can be easy cold bend processed and hot molding. Hence, it can be widely used in construction and decorations. Our wide range of high quality polycarbonate embossed rolls and sheets can be used in various ways and for various applications such as for veranda glazing, safety or vandalized areas indoor/outdoor signs or instrument panels. They are exceptional impact strength and virtually unbreakable. Further, they are UV resistance, self-extinguishable and light transmittance. Such rolls and sheets come with tiny embossed patterns on one side. Such design not just enhances the look of the polycarbonate rolls and sheets but also enhances its firmness and anti-static function. Besides, they add special effect to the sheet. For the diverse requirements of our clients we are involved in offering an extensive range of PC Embossed Frosted Matt Sheet. Offered sheets are widely used in canopy, alleyway ceiling, green house plant and many more. Our products are highly demanded in market due to their superior quality and accurate dimensions. Moreover, these are available in market at reasonable prices. With state-of-the-art infrastructure facilities, we are engaged in offering a large gamut of PC Embossed Ice Crush Sheet. 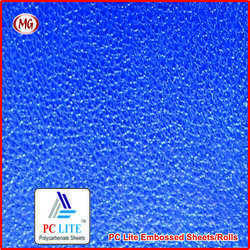 These PC Embossed Ice Crush Sheets are highly acclaimed among our clients due to their fine quality and reliability. These PC Embossed Ice Crush Sheets are manufactured by highly skilled professionals using latest technology and best quality material. Moreover, it can be availed at market leading prices.